His Excellency Sultan bin Saeed AI Mansoori is Minister of Economy in the UAE for over a decade. He has outstanding academic achievements; holding a Bachelor's degree in Industrial Engineering & Management Systems from Arizona State University - USA, and a Diploma in Computer System Analysis from the Institute of Computer Technology, Los Angeles, California - USA. 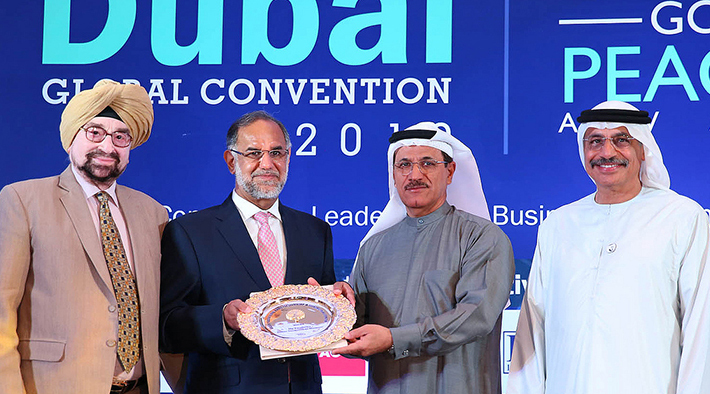 He has earlier served as Vice President of Dubai Islamic Bank, Chairman of Aman (Dubai Islamic Insurance Company), Minister of Transport and Communications and Sector Development. He had the unique distinction of being a Member of Supreme Council of GCC, and is a foremost intellectual of not only UAE, butthe entire Middle East. He is a multi-faceted personality. He is presently the Chairman of the Supreme Committee for Consumer Protection and Economic Cooperation Committee, Chairman of the National Committee for the Follow-up Program of Investment Climate, and Chairman of The UAE SME and industrial Coordination Council. He is on the Board of Directors of the Securities, Commodities and Insurance Authority, and also Chairman of the Federal Civil Aviation Authority, Chairman of The Emirates Authority For Standardization & Metrology and Human Resources Council. He is a Member of the 'National Committee on Population CompOSition', and of 'Committee on Finance and Economy'.